Education reforms not so easy and that calls for deep thought! 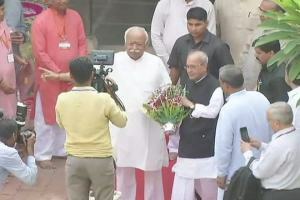 Former President Pranab Mukherjee was in Nagpur the other day. That raised many eyebrows. For the right and wrong reasons! The guest speaker said that India’s identity is about tolerance. Fine, perhaps we would have said, Indian polity too should be known for its great tolerance. Diversity is another Indian character, said the former head of state. We would have said rather diversity of thought, speech and writing is our defining character. And so it can go on. On the whole, contrary to the much fear and apprehension expressed at many fora, Pranab da surprised everyone by winning hearts at the RSS camp as well as in the Congress fraternity. That is wisdom and experience and a bit of a tolerant outlook on the part of the senior Congress leader. Now, we see the education sector in India and decry the steep fall in standards and shall we say in the way the education ministry is going about in its endeavour to search for an identity for its own programmes. Education is a serious field. We should know that in ancient Greece, education was a very serious affair. The Encyclopedia Britannica, 1974 edition has a 100 page write up under the head, education! We would recommend our hon’ble ministers of education in the states and the Centre must glance through these pages. Now, in the four years that elapsed, the Central Government didn’t do a thing for which we may like to recall and remember after this government completes its term. For the simple reason, we imagine, the government didn’t think it right to call for the experts, great thinkers and intellectuals or see what is happening in other progressive countries and societies. Now, we read a small news item, so small that we might have missed that this government wanted to replace the many education regulators, UGC, AICTE and others with a single body. Please don’t do that! It might lead to more confusion. Why do we say this? You first show us the experts who can demonstrate some credibility. Niti Aayog has advised so, says the news item. Niti Aayog is not the competent body. You have to have an Education Commission and the names must be publicly known and winning credibility. Anyway, the proposed reform is postponed. Better it be so. Wait and invite opinions and views. There are eminent educationists in the country. Consult them and also consult even some foreign experts, invite scholars from Oxford and Harvard and beyond. Let one or two Nobel Prize winners join and give India the best expertise in the areas of specialisation, more so in higher education.